Does Motherhood Equal Retirement in the Biz? 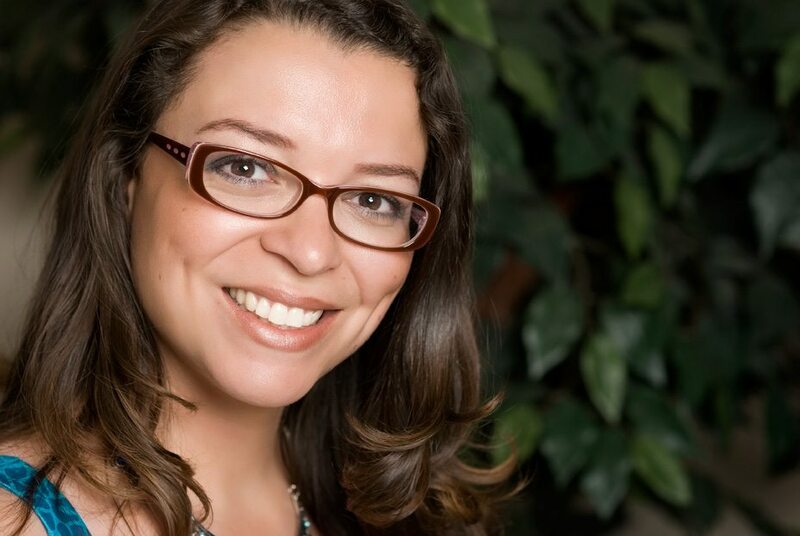 You are at:Home»Entrepreneurship»Career»Does Motherhood Equal Retirement in the Biz? Last year I committed a film industry cardinal sin for women behind the camera: I had a baby! While it feels like actresses and celebrities get celebrated when they find themselves flaunting a cute baby bump, all I ever heard as a writer/director was that having a baby meant I was going to have to give up my career. That’s probably why I waited so long to even make up my mind about wanting a child. There’s no trial period on motherhood and no return policy on babies, so I had to be sure, right? I had to want it more than I wanted to be a filmmaker. I had to love the idea more than I loved writing. I had to love my child more than I loved being on set. So, it took me a long time to feel like I could take that leap. And when I finally did it in 2013 and found myself with child I had no regrets. I was ready… Or I would have 40 weeks or so to get ready by reading every book and every blog on babies out there. And if it meant I was going to have to give up everything to become a mother, I had made my peace with that too. My career wasn’t in a great place anyway. I had finished filming a short and was planning on having it completed before baby was born. Other than that, I found myself without a lot of prospects for projects. I had spent the previous years developing feature films that weren’t moving forward, taking countless meetings, traveling abroad, spending a lot of money in the hopes of getting a feature film financed. I was tired of waiting for these projects to get made before I “retired” and had a baby. And then I realized these projects may never get made. Was I going to wait forever to be a mother? 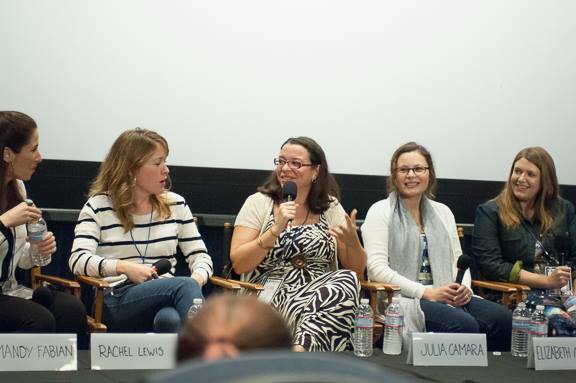 I had just found out I was pregnant when I got invited to speak at this WGA panel at the LA Femme Film Festival. Just as I was coming to terms with the idea of taking a long break from the industry I’m surprised by this opportunity. It was like the universe was proving me wrong. I was still a filmmaker, bun in the oven or not. When I participated in the panel I was still not telling people I was pregnant. I remember being terribly nauseous the entire time and having a hard time focusing on the subject (Morning sickness is no joke!). I was later told nobody noticed and I did fine (If those were lies my fellow women on the panel told, I appreciate it, I needed to hear it.). Against all odds and my own beliefs, when I was six months pregnant I optioned a script. Taking a lunch meeting when you have a huge baby bump is interesting, to say the least. Keeping the conversation on work and not just your baby proved nearly impossible. That little lady inside of me was already the center of attention and she wasn’t even out yet. 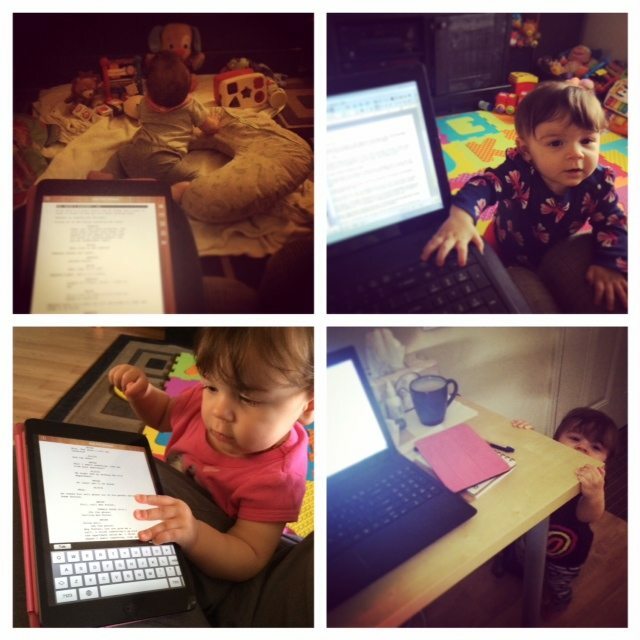 When baby was about five months old the script I optioned went into production. I visited that set a few times with baby in my arms. I was clearly being proven wrong. I could be a mother and a filmmaker. There were even a few moments of running around with baby strapped to my chest in the carrier as my producer and I talked contracts and made some phone calls. My daughter is almost eleven months now. In the short amount of time she’s been a part of my life I’ve managed to lose a lot of sleep, change a lot of diapers and also get a lot of work done. I have taken Skype and phone meetings when I hoped she would be napping, only to be interrupted by her crying and/or doing something she’s not supposed to do. There’s no escaping it, covering it up or disguising it. Nor do I want to do any of that. I am a mother. Sometimes that gets in the way of what I do and that’s okay. This past week I completed a screenplay I had started writing before she was born. There was a time in my life when it only took me 30 days to complete a fist draft. Those days are behind me now, for sure, and that’s okay. I have a different relationship with time now. I’m on baby time most days. It means a lot of interruptions but it also means I prioritize what’s important. It’s much easier to say no to people. Having to share your time with your child means that the few hours of the week that are truly only my hours are worth gold. Even while writing this I was interrupted about five times. It made me shift slightly what I wrote because I lost my train of thought. But my child has taught me to adapt and to be flexible. The biggest lesson I’ve learned is that my life can be whatever I want it to be. Sometimes the limitations are completely created by myself alone. I believed for so long that having a child and being in this industry was impossible that there was a part of me that believed I couldn’t get pregnant. There was also a part of me that believed it was going to be impossible to continue to write and work and make movies and be a mother. When I look back now, I have a hard time remembering what it felt like to live with those beliefs. Motherhood is not easy. The film industry is not easy. I have days when I feel like I’m failing at everything. But guess what? I had days like that before I had the baby also. I’m incredible thankful to be where I am and to have love and support around me. Next Article Social Media- What’s the Big Deal?